Don't let tooth loss get you down. 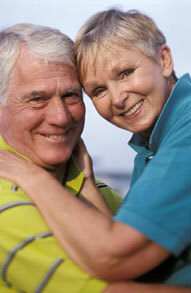 Gordon Family Dental in Lehi, UT offers an array of denture options, including fixed partial dentures. Call our office today at (801) 766-6344 to schedule a consultation! A denture is a removable replacement for missing teeth and adjacent tissues, and has been used for many of our Lehi patients. It is made of acrylic resin, sometimes in combination with various metals. Candidates in Lehi for complete dentures have lost most or all of their teeth. A partial denture is suitable for those who have some natural teeth remaining. A denture improves chewing ability and speech, and provides support for facial muscles. It will greatly enhance the facial appearance and smile. For more information on Dentures in the Lehi, UT area call Gordon Family Dental at (801) 766-6344!